GALION — The Galion City School District, in partnership with the USDA and the Ohio Department of Education, is sponsoring a Summer Food Service Program in Galion this summer. 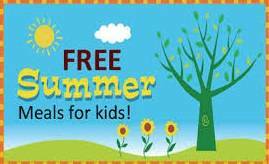 Free lunches will be provided to children ages 1 to 18 from June 5 through July 28 at four locations. Libby Lane Apartments , 11–11:30 a.m.
East Park, 11: 15 a.m.-11:45 a .m. Heise Park Shelter House, noon-12:30 p.m.
Galion Arms Apartments, 12:15 p.m-12:45 p.m.
To comply with state and federal regulations, all lunches must be consumed on-site and are available on a first-come, first-served basis. Program menus will be posted at each site and on the Food Services page 1t www.galionschools.org. No meals will be served July 4 to allow staff and volunteers to enjoy the holiday with their families. Free lunches will be provided to children ages 1 to 18 from 10:15 a.m. until 12: 15 p.m. through August 10 — Monday through Friday — at Bucyrus Secondary School and at Bucyrus Elementary School from 11:30 a.m. until 12:15 p.m.
Bucyrus Lions Field Park, 11-11:30 a.m.
Bucyrus Harmon Field Park, 11:45 a.m.- 12:15 p.m.
Bucyrus Public Library, noon-1:00 p.m.
Bucyrus Aumiller Park Pavilion, 12:30-1:15 p.m.
As in Galion, lunches are available on a first-come, first-served basis and must be eaten on site. Adult meals will be available for purchase at a cost of $3; correct change is required. Program menus will be posted at each site and on the Food Services webpage at www.bucyrusschools.org . These programs are sponsored and funded by the USDA, and monitored by the Ohio Department of Education. “The summer program is great for kids and families that are struggling to get by,” said Bucyrus City Schools Food Service Director Lorie Pennington. “Since the economy in this area is still working toward improvement, the school board and the administration thought it vital that the food service department continue with the summer program. No meals will be served July 3 or July 4 in Bucyrus to allow staff and volunteers to enjoy the holidays with their families. For more information, call Lorie Pennington at 419-562-5355.